Charlie Mosbrook will perform on May 18th. Guthrie earned him 2nd place in the Woody Guthrie Folk Festival Songwriting contest. Doors open at 6:00 p.m. Adults $10, kids $5. 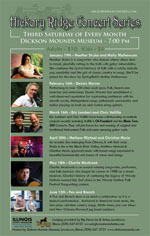 Visit http://ginridge.com/extras/hickory-ridge-concert-series/for information about the artists.